When I have little babies in my house, I think my favorite time has always been bath time. I have never had a baby who didn't love bath time so it was always a fun time. My most recent baby, Rebekah, is really starting to get into her bath time. This means that she is discovering bubbles, splashing, warm water running over her toes and tubby toys. When it comes to baby bath products, the options are seemingly endless. When you are standing in the store staring at the baby care products, there are so many different brands...how in the world do you pick out the one that is just right for your little bundle of joy??? Well, when I was a new mom, I went with the good old popular brand that my mom used. It was a no-brainer for me---but then again, I never did put much thought into what I was using on my baby's skin. What kind of chemicals are in this product? What sort of effect could it have on my baby's skin? What creates the scent? Is this product SAFE for my little one? These are all questions that you may or may not have asked yourself...but that you probably should ask. At thinkbaby and thinksport, our approach to creating safer products is simple - We share your concerns. Just like you, we believe that people deserve the very safest products. Whether the product is being used by a newborn or elite athlete, our mission is to deliver products specifically formulated to be free of harmful chemicals. In the creation of our products, we focus first on material safety. We worked around the clock, consult with experts around the world, and test the products to be certain that they follow our stringent requirements (but never on animals) Our mission is directly inspired by those little hands that wrap around our baby bottles. The health and safety of children isn't just a powerful source of motivation at thinkbaby, it is something we consider a responsibility. We are proud to offer our safe and healthy line of products and excited. We are always identifying new products to address other areas of concern. In effect, your purchase of products directly contributes to the research and development of new products. I am constantly amazed at the companies that are changing to healthier, safer products for our babies. As a mom, it makes me feel good to know that it matters to companies like Thinkbaby, and that good options are being made available for me. So, for this review, Thinkbaby sent me their Baby Body Care Essentials Set. I was really excited to check this kit out because, of course, I have a 7 1/2 month old baby girl who LOVES bath time and most of the things in this kit are for bath time. This kit contains all of the "essentials" for bath time and beyond. 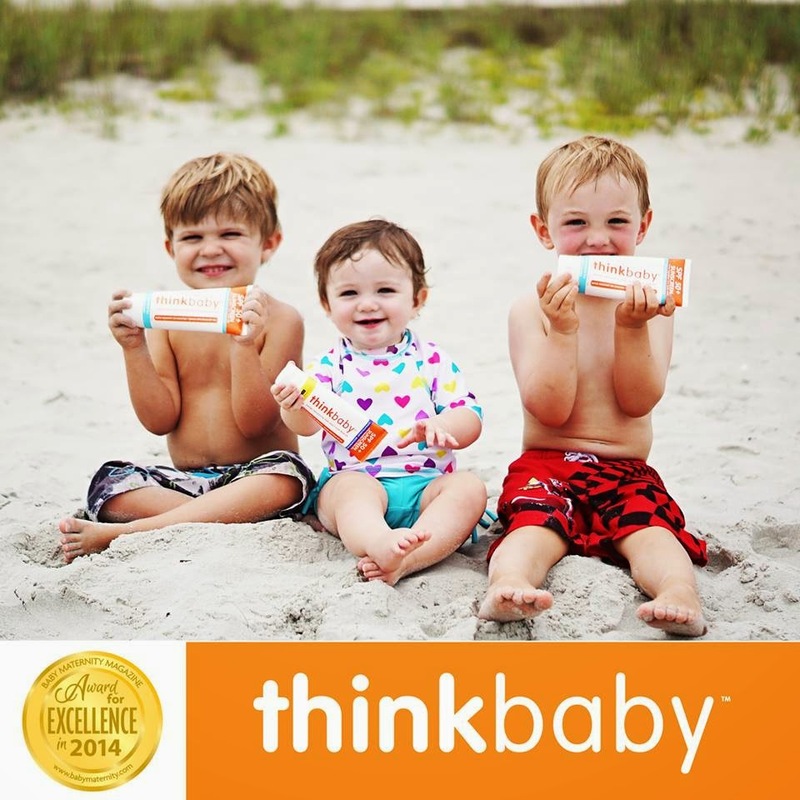 Thinkbaby even thought about the summer months and included some sunscreen in this kit as well. The bottles that are in this kit are generously sized and will last me a very long time. I was pleased to find Baby Shampoo & Body Wash, Baby Lotion and Bubble Bath as well as the Safe Sunscreen. Bath time rolled around again this past week and I eagerly dug into my Thinkbaby kit. I absolutely LOVE the baby shampoo & body wash! It is so bubble and smells amazing. I think the smell is like a fresh, citrus scent and it is very calming as well. My little girlie just sits there, chewing on her tub toy and is so relaxed. This shampoo and body wash is also a tear-free formula so you don't have to worry about getting soap in baby's eyes. I try not to do that but it does happen on occasion. This shampoo and body wash is free of Parabens, phthalates, 1,4 dioxane, sodium lauryl sulfate and harmful chemicals. That is hard to find these days. I also noticed that without adding bubble bath to the bath water, this body wash made lots of fun bubbles. I did like the bubble bath though. I used it on a different night and it too made some pretty nice bath bubbles. Rebekah is just learning about bubbles and pauses while playing to look down at the water and touch the bubbles. Goodness...this is such a fun age!!! Now the lotion is really lovely as well. My daughter loved playing with the bottle and I loved applying the lotion to her skin. It didn't have a scent that I could tell but it definitely gave her good coverage and moisture. She doesn't have any skin issues that I know of, but it is still nice to have something gentle for her. Baby skin is so delicate and tender, I want to take good care of it. I have a friend at my church who has a baby that cannot tolerate anything scented so I told her about this lotion. She sounds very interested in it so I might share with her. I love helping others and if this works well for her, that would be so amazing. This Thinkbaby Baby Body Care Essentials Set retails for $37.99 and would make a wonderful gift for a new mom, a mom-to-be or a mom like me, who has been at this "mom thing" for a while. :) Trust me...just because I have four children, doesn't me that I don't appreciate a thoughtful gift once in awhile. I love this kit and definitely recommend it to anyone, especially to parents and caregivers of little ones. Make sure you stop by Thinkbaby's Facebook page and check out all the fun happening there. Disclaimer: I received no monetary compensation for this post. I did receive free Thinkbaby products for review purposes. All quotes and stock photos are from the Thinkbaby website and email. Prize is being provided and shipped by the sponsor. This blog is not responsible for lost, stolen or damaged prizes. All thoughts and opinions are 100% mine. I would like to try their stainless steel bottle---so cool! @Vesper Meikle - Anyone within the continental US. I would like to try the think baby bottle starter set or the sunscreen both we could use for our little one! I'd love to try the Thinksport Insulated Sports Bottle - 25oz (750ml) - Light Pink. The Thinkster cup would be nice for my great-niece. I also like the sunscreen. I'd also like to try their orange Bento Box. I would like to try the Thinkbaby Starter Set /Gift Set. The Thinkster of Steel is really cool looking. I love that their products are thoughtfully made with BPA free materials! I like the Thinkster cup. I like the The Thinkster Straw Bottle. It looks really cool. I'd like to try the The Thinkster - Straw Bottle. I like The Thinker System Sippy Cup!! I would like to try the Thinkster-Straw Bottle in Pink.